“Tim Burton’s Superman movie starring Nicolas Cage” means something very different now than it did in 1997, and ever since Warner Bros. scrapped the notoriously doomed project after years of script rewrites and budget issues, it has increasingly become one of the more fascinating footnotes in superhero movie history. Whether the film would have been any good is anybody’s guess—given the respective career trajectories of both Cage and Burton, it’s easy to say, definitively, “no”, but that might not be entirely fair—however, it would have likely been interesting at the very least, and, more importantly, commercially successful. The reasons for its failure will be explored in depth in the upcoming crowd-funded documentary The Death Of Superman Lives: What Happened?, which will be released on VOD on July 9. The trailer for the documentary shows several of the would-be screenwriters talking about the direction the film would have taken the Clark Kent story—including a shot of a Superman hockey jersey-clad Kevin Smith—and how great it all could have been had it actually been realized. Tim Burton appears, too, and still seems shaken up about the whole fiasco. 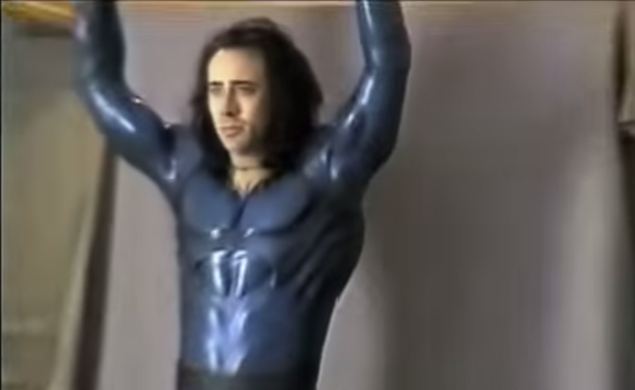 Most noteworthy, though, is the fact that the trailer includes recently unearthed test footage of Cage as Superman himself, with long hair and wearing an all-blue bodysuit, generally looking around in the way that Nicolas Cage does. According to The Guardian, at least in some versions of the screenplay, the movie would have told a more existential, psychological tale of Superman as he wanders around the Earth without the knowledge of his true identity, and the costume Cage is wearing in the test footage seems a little weird but also fitting, somehow. There’s even more footage of the screen test in an exclusive clip from the Los Angeles Times, which has now leaked on YouTube. Cage, for his part, looks to only appear in the documentary in this (and other) archived footage. The producers presumably didn’t even bother asking Cage to appear in interviews, because by all accounts he has said “yes” to every movie offer made to him in the last decade or so. The film could have gone so many different ways that it’s easy to let your mind run away with fantastic possibilities. But one very real possibility is that the unmade film is more interesting now than the film would be if it had actually seen the light of day. For better or worse, we will never know.